After a successful weekend at Defeat of Jesse James Days in Northfield, I found myself sold out of my all time favorite soap, Oatmeal Milk & Honey. So, on Saturday, with a little time to myself, I headed down to my shop (it’s in the lower level of my home) to mix up a batch of soap. First I had the hardest time deciding whether to make the bars round or rectangular. I spent this summer selling bars in both shapes and collecting opinions from people on which they prefer, and honestly, I don’t think people really care about the shape of their soap. They just care about how big it is and how great it smells. Hmm……so I decided to make this batch in my rectangular loaf molds. Here they are all lined and ready to go. 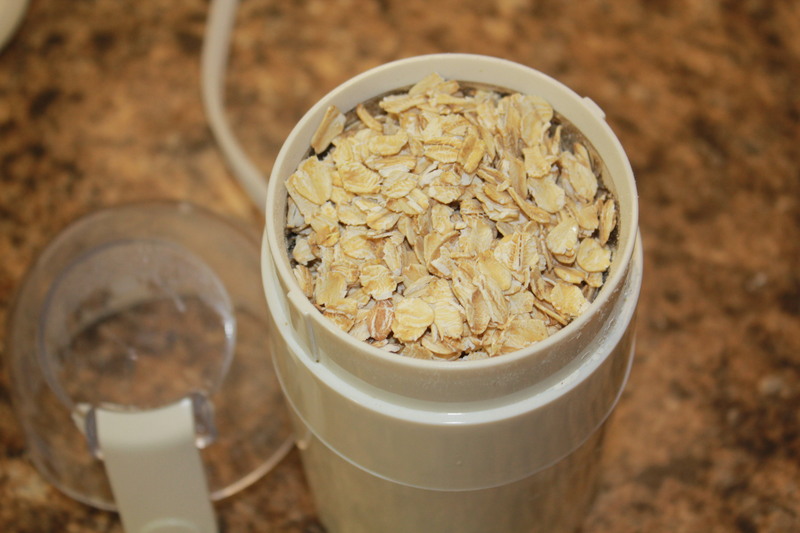 I’m using goats milk, real honey and colloidal oatmeal, which is just a fancy term for finely ground up oatmeal. All these ingredients make the bar of soap super moisturizing and great for dry winter skin. 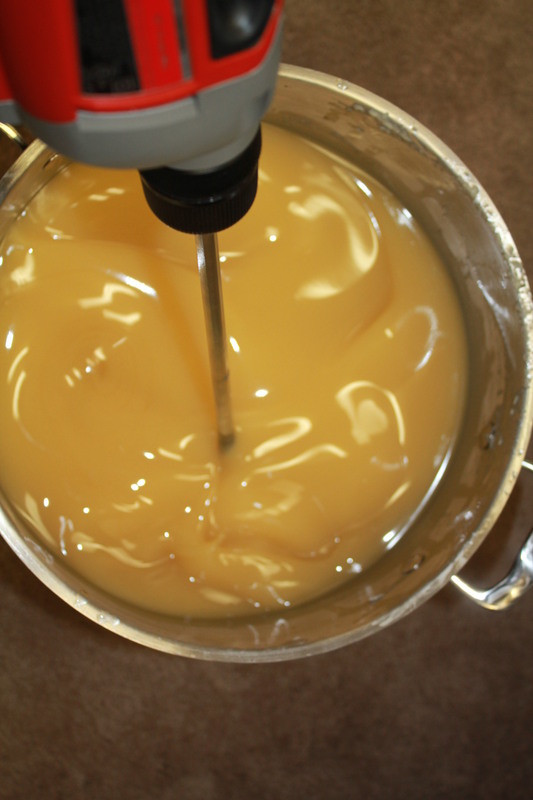 The first step in making my soap is mixing the goats milk, water and lye. I had pre-frozen my fresh goats milk and used an ice bath the help keep the temperature down as not to burn the goats milk. 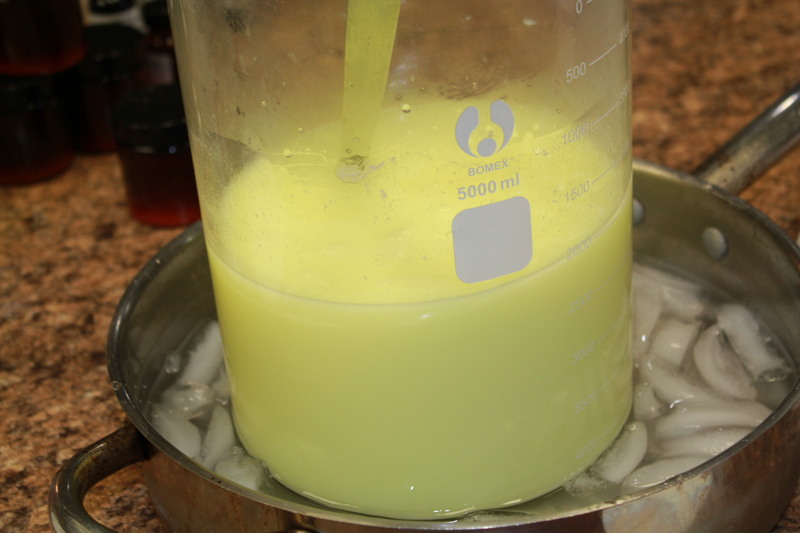 When you mix lye with any liquid, a chemical reaction occurs and heat is produced. The lye mixtures almost instantly heats up. As the goat’s milk heats up it turns a brighter yellow color. Now it’s time to measure out all my oils and butters. Just like cooking, right! 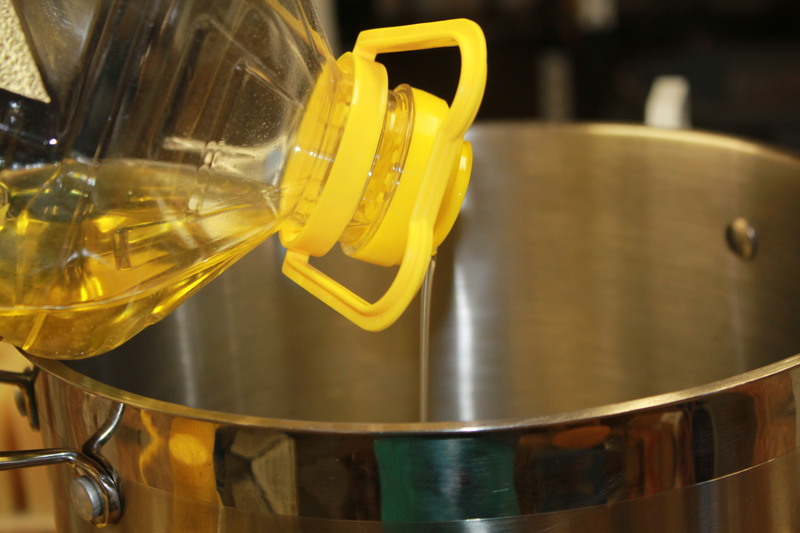 I usually add my liquid oils to my big stainless steel pot first. 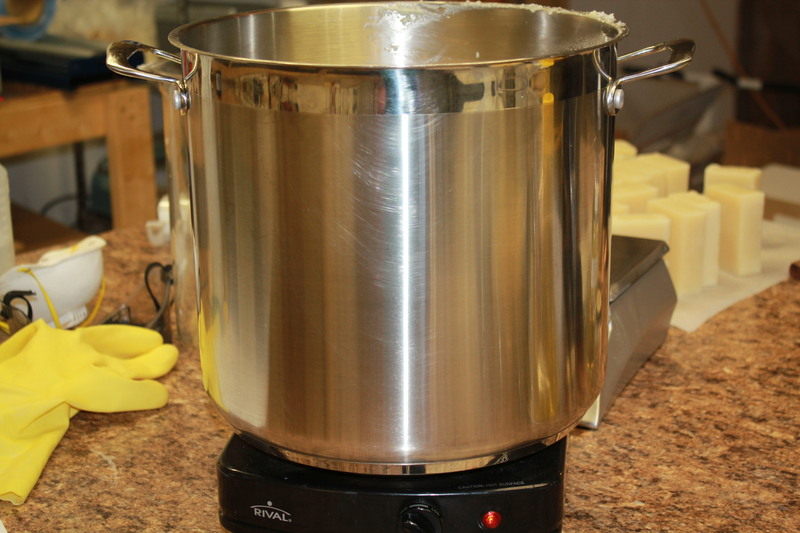 Then, after I measure the solid oils and butters I add them each to the big mixing pot. I use a single electric burner to melt them all together. Here they are, all my oils and butters melting away. I usually melt them on low so they don’t get too hot. Usually at this time, I go check on the kiddos, make sure the house isn’t burning down, break up any fights and make my way back to my shop. I’ll need to measure out my fragrance and grind up the oatmeal. Now it’s a waiting game, I have to wait for the oils and the lye mixture to cool down a little. I usually like to pour them around 100 degrees or cooler. It can take a long time for the oils and lye to cool, so I go back to my mom duties for a while and will come back to the soap later. A couple loads of laundry done and I’m back at soap making. 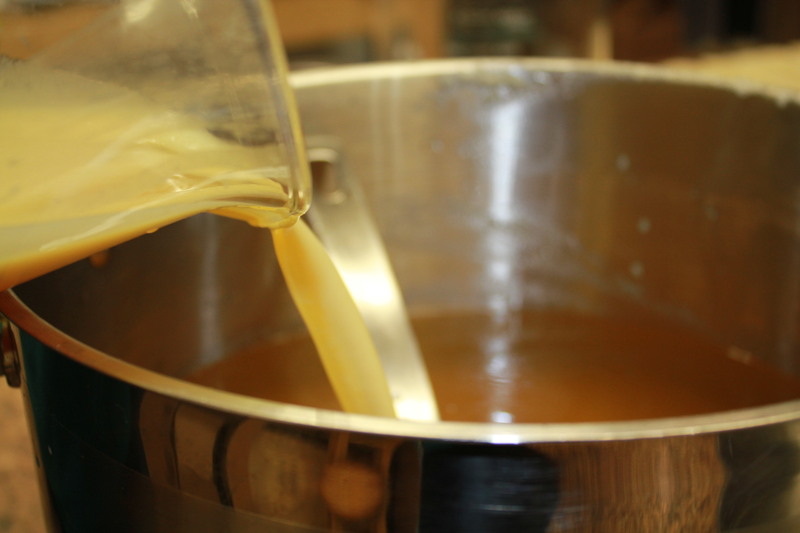 The oils and lye are about the same temperature and now it’s time to make soap! I put back on my gloves, eye protection, and apron. I slowly pour the lye mixture into the melted oils and butters. 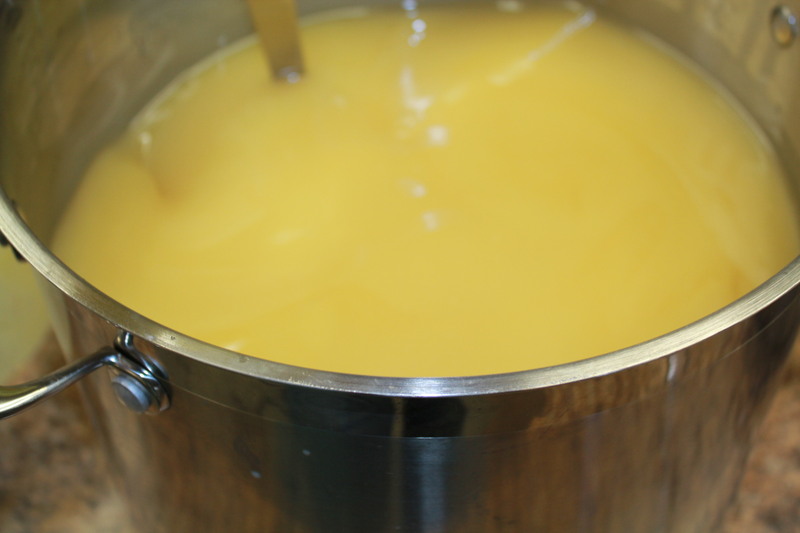 Stir, Stir, Stir and the creamy goodness starts to take shape….. I use a drill to quickly get the soap to trace. It saves my arm from falling off, stirring can be a real workout, and it keeps my soap free of bubbles. 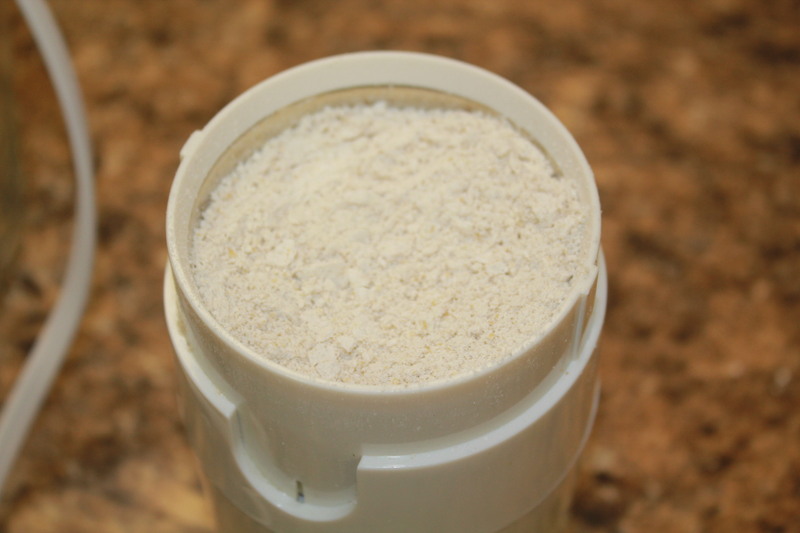 Many soap makers use hand blenders, like the hand held blenders used for making drinks or malts. It does get your soap to trace really fast, but I hate all the bubbles it leaves in the soap. 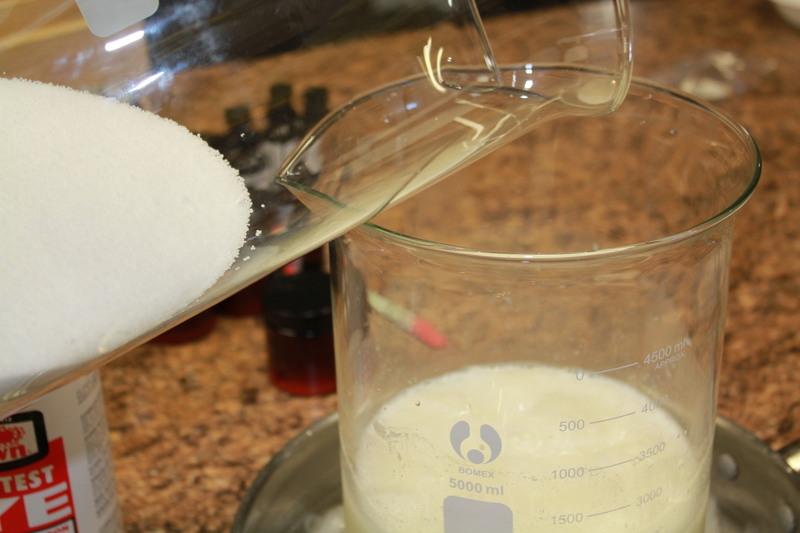 Trace is a soaping term that just means that the lye and oils have completely mixed and have started to change into soap. The soap starts to get thicker and creamier at this point, kinda like pudding. Just like cooking, right! I add the oatmeal, the honey, and the fragrance at this point. I stir it for just another minute to make sure its good and mixed in. 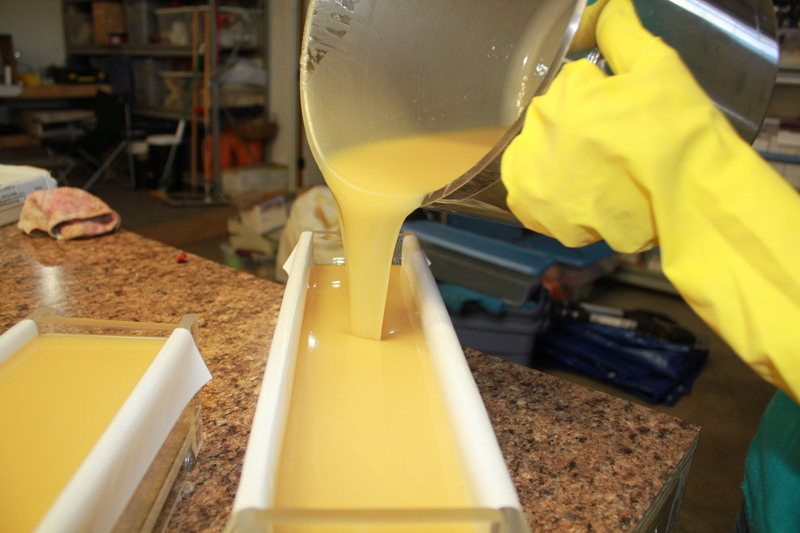 Now it’s time to pour the soap into the molds that I lined ahead of time. It smells amazing, and goes in smooth and level. I cover my molds with their lids and place them into a cooler so the soap get plenty of insulation for the soaponification process. Soaponification is another soaping term. It’s just referring to the chemical process that occurs when soap is made. 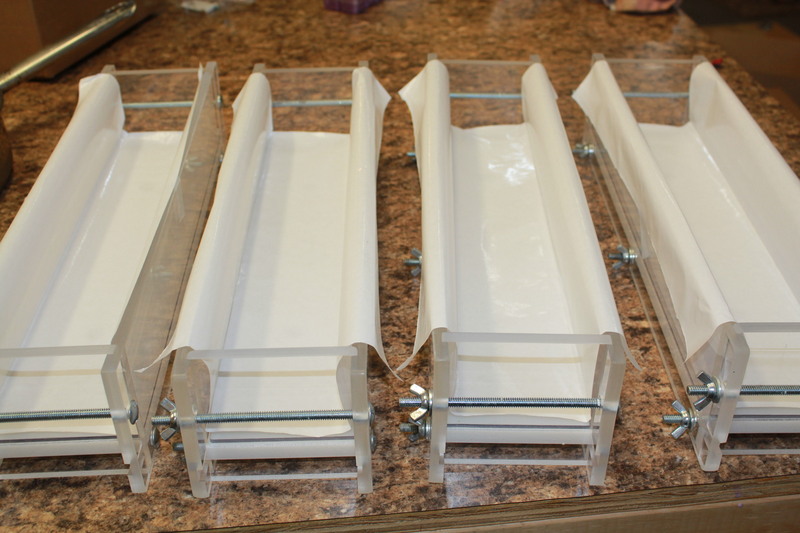 After a day or so, I remove the soap from the cooler and slip the full loaves of soap out of the molds. Soon I’ll cut the soap loaves into individual bars. I do this by hand, one bar at a time. I do my best to cut all the bars at about 5.25 to 5.65 oz. My method is not perfect by any means. That’s part of the charm of handmade! When the soap cures it will have lost some of it’s water weight. By cutting the bars larger, my customers are still getting a bar of soap that’s approximately 5oz. I cure all my soap for a minimum of 4-6 weeks before I wrap it up to sell. The one thing about soap….the older it is, the better it is and the longer it will last. Look for my handmade Oatmeal Milk & Honey soap on my website www.serenadeproducts.com in a few weeks or on my Etsy shop SerenadeNaturals. This entry was posted in Handmade Soap and tagged cold process soap, handmade soap, how to make soap, oatmeal milk & honey soap. Bookmark the permalink.